‘Transport for a Changing World’ was the theme of the 2014 ITF meeting, the seventh annual summit to be held at the Leipzig conference centre in Germany. 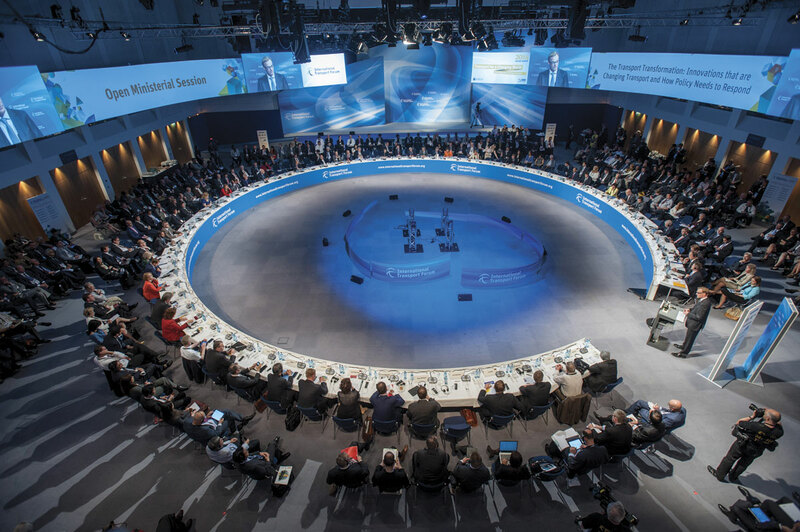 In a complex three-day programme, ministers, participants and press from around the world considered topics across the whole transport agenda from cycling to air and maritime activity. There was little specific to the bus and coach industry but the impacts of work on traffic congestion, city design and road safety provide opportunities and challenges for the sector. Across these activities, the key theme from the forum was targeted use of the growing volume of historic and real time data now available. The programme included open and closed sessions with the ministers, workshops, round tables and media presentations, quite a challenge to select a complimentary set of activities to participate in. Fortunately, the lead language of the summit was English with mainly keynote presentations from the French and German delegations in their own language. A good range of simultaneous translation was however on offer including Russian and Chinese. 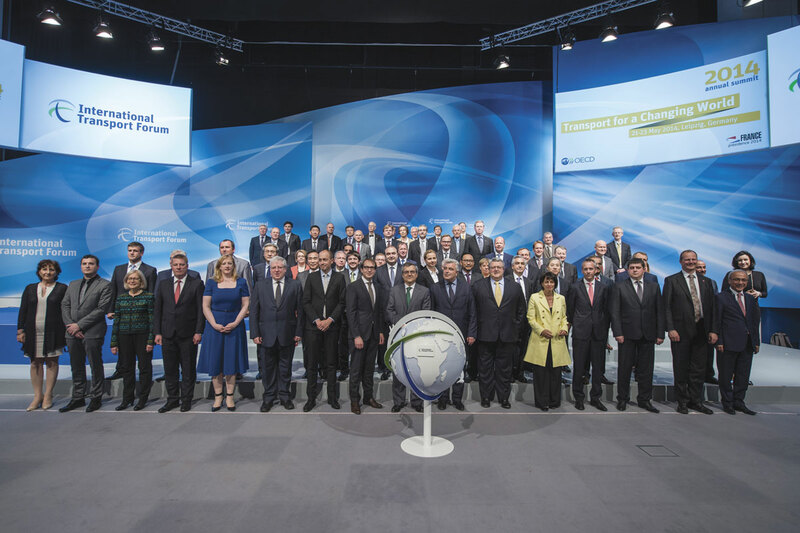 The International Transport Forum at the OECD (The Organisation for Economic Co-operation and Development) is an intergovernmental organisation for the transport sector with 54 member countries. It acts as a strategic think tank for transport policy and organises the annual summit of ministers of transport. The International Transport Forum’s mission is to help shape the transport policy agenda on a global level and ensure that it contributes to economic growth, environmental protection, social inclusion and the preservation of human life and well-being. 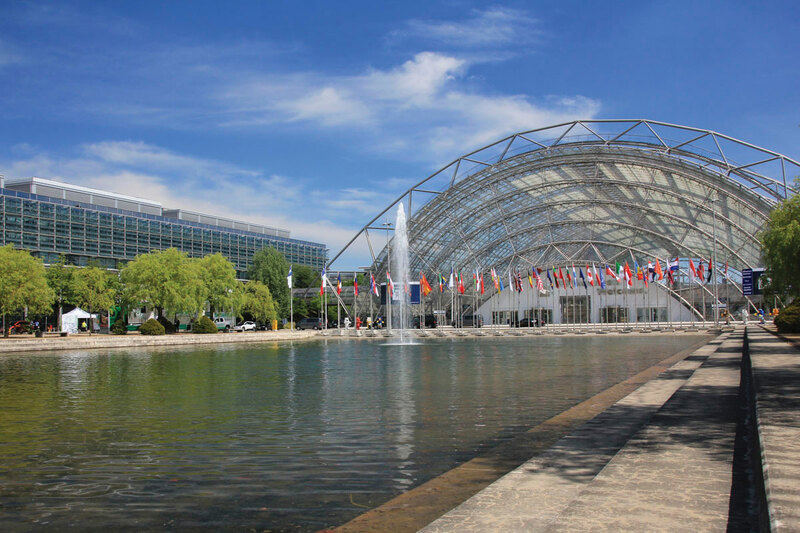 ITF’s roots can be traced back to the founding of the ECMT in 1953, an organisation charged with bringing co-ordination to the rebuilding of Europe’s battered transport infrastructure. Expansion internationally and adoption of the ITF title followed in 2006. France currently holds the ITF presidency and will be succeeded in 2015 by New Zealand. The ITF secretariat is based in Paris with Portuguese transport professional José Viegas in the role of Secretary-General. For the first time, the ITF hosted a master class aimed at drawing ideas from participants about the future design of cities to meet the requirements of the people who live or work there, getting away from the car supreme concept. The keynote introduction from Helle Søholt, Founding Partner and CEO of Gehl Architects in Denmark, referred to work which has been ongoing in Copenhagen since 1962. Her experience showed that making streets car free had increased the pedestrian foot fall by a factor of four and by doing this in a coherent, connected manner, people were likely to use it. The result is a city where 35% of journeys are by bike and 32% by public transport. Interestingly, she claimed 70% of the cyclists were on a ‘year round’ basis although the remainder appeared to revert to the car rather than be captured by public transport. Specific examples of innovation in city design were displayed including a lightweight modular bus stop platform made from recycled electric wire plastic casing and a remote control app for the blind to control pedestrian crossing lights, reducing noise pollution. In a workshop moderated by Deutsche Welle-TV presenter, Conny Czymoch, seven speakers presented their experience of the role for ‘big data’ across a range of transport activities. ‘Big data’ is characterised by vast collections of high volume, high speed and high variety dataset obtained from sources including sensors, video, mobile devices and social media. As much data is now created in 48 hours as humans have gathered since ‘the dawn of civilisation’ to the year 2003. The raw data has no or little value so on line processing, ‘middleware’ for data cleansing and real-time analysis of data is essential to deliver immediate solutions for transport challenges. ‘Big data’ can help governments, businesses and individuals to make more informed decisions. First on was Singapore’s Transport Minister, Tuck Yew Lui, who provided statistics showing that strict controls on car ownership and usage including variable road pricing meant 65% of daily trips (around 7million) were by public transport with a further 9% by taxi. Data collected on bus usage showed a number of hot spots where capacity was insufficient so the government instituted a strategic injection of new buses suggesting that they could not leave it to the bus company alone to insert the additional capacity. Wi-fi features on Singapore’s buses and this has been used to encourage customers to move to less congested areas of the bus by providing better connectivity in these locations. Canadian Transport Minister, Louis Lévesque, followed, focusing on the challenges that cold conditions can pose for data systems and expressing concern that the speed of new data creation is faster than governments can make policies to use it. Representatives of the major data handling organisations, IBM, Oracle, Inrix and Carna then took to the floor to demonstrate the opportunities that ‘big data’ provides, including the intermodal navigation system developed by Inrix for the BMW i3/i8 electric cars which will direct the user to public transport where this presents a better journey option. The workshop discussed the key challenge of data ownership. ‘Big data’ is essentially anonymous when used for activities such as advising of traffic congestion in navigation systems or determining passenger hotspots such as in recent Dutch research identifying the bus stop where passengers are most likely to board without paying. Looking forward, Data speeds will increase again on the advent of 5G such that vehicle to cloud communication should become the norm for tolling systems and making hardware currently being planned obsolete before it is commissioned. For the open ministerial round table on the second day of the conference, moderator Pat Cox, a former President of the European Parliament, invited three eminent industry leaders to contribute to the topic ‘Innovations that are Changing Transport and How Policy Needs to Respond’ which was followed by commentary from the Chinese, Russian and Moroccan Ministers. The impact of information and communications technologies (ICT) was the cornerstone of the industry leaders’ presentations which also highlighted blockages presented by current legislation and agreements. Volvo President and CEO Olof Persson outlined two forward looking projects being developed commercially, the ‘Platooning’ concept for lorries and cars and the full electrification of city buses in major cities. Demonstration of both projects is planned to take place in Gothenburg, the earlier stages of the bus project being covered in B&CB issue 1260, 24 January 2014. ‘Platooning’ envisages a number of vehicles being controlled from a lead vehicle, the ICT having been developed to support this. Implementation would require fundamental legislative change as the ‘1968 Vienna Convention on Road Safety’ requires the driver of a vehicle to be in full control of it at all times. Bryan Mistele, President and CEO of major traffic data collection organisation INRIX Inc, focussed on the impact of traffic congestion. He opened with the perhaps surprising revelation of Brussels being the world’s top city for congestion in terms of average hours lost by a commuter each year. Antwerp was not far behind, just in front of London and Rotterdam. Stuttgart completed the top five with the worst placed US city, New York, coming in tenth. Bryan demonstrated a clear link between changes to a country’s GDP and congestion, the latter increasing by 3% for every 1% increase in GDP, and argued that good use of ‘big data’ could impact congestion by 10%. INRIX is very active in data handling in the UK which, processed in real time, gave diverse opportunities such as management of people movement (used at the 2012 Olympics based on mobile phone traffic at cell level). Bryan also revealed that Hedge Fund managers buy data to predict congestion trends and hence economic activity. Completing the industry trio, Lutz Bertling, President and Chief Operating Officer of Bombardier Transportation, challenged the popular concept of growing cities determining they needed a specific mode of transport such as a metro and the use of lowest acquisition cost for the choice of supplier. He recommended that cities tender for a transport system capable of delivering its transportation needs for the system’s life span and took into account all associated costs including land acquisition and noise reduction measures. 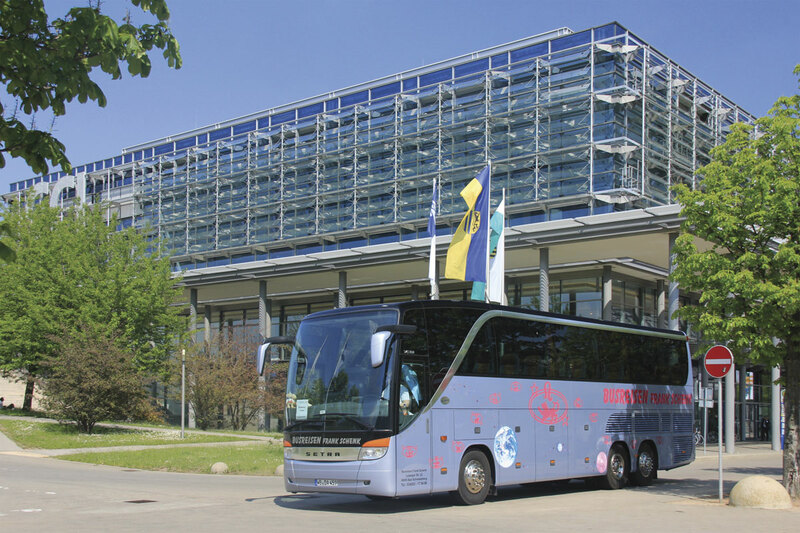 Lutz showed images of the first Solaris electric bus operating with its Primove inductive charging system in Braunschweig, which, whilst not curing congestion, was significant in removing air and noise pollution with no visual impact on the landscape. 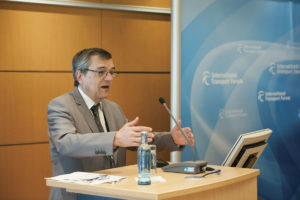 Summing up the session, ITF Secretary General José Viegas stressed that policy makers should provide a range of options since a single option will make too many people feel left out. These needed to be complimentary in time, space and integration whilst projects needed to be evaluated for direct and indirect costs for their whole life cycle. ITF 2014 hosted the launch of the latest road accident data report on more than 40 countries, compiled and interpreted by ITF’s International Traffic Safety Data and Analysis Group (IRTAD). 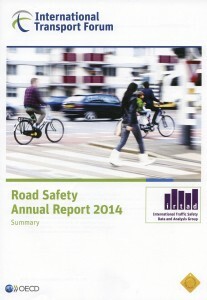 The report covers data from 2012 in detail with an overview of provisional data for 2014. The report focuses primarily on the trends in road fatalities with more than ten years of comparative data from around 30 of the member countries. These show signs of a levelling off in the rate of reduction of fatalities apparently driven by two factors; the increase in the percentage of the population cycling overtaking the overall rate of risk reduction in cycling and increasing percentage of pedestrian fatalities that fall in the growing over 65 age group. In a third of the member countries, fatalities increased in 2012, in some cases significantly. Breaking the data down to fatalities per 100,000 population, there was almost a factor of ten between the lowest, the UK and Iceland, and the highest, Malaysia. There is no specific reference, al least in the summary report, to fatalities associated with bus and coach operation, an ‘other’ category covering anyone outside of being a pedestrian, cyclist, powered two wheel rider or car occupant. The UK is shown as having one of the lowest percentages in the ‘other’ category. One of the side events for the media was a briefing on the research and development activities of the International Energy Agency’s (IEA) Hydrogen Implementation Agreement. Presenter Elli Varkaraki, a Senior Scientist at Belenos in Switzerland, outlined the 50 year history of work on hydrogen as a transport fuel. Around 2,700 vehicles are on the road, supported by some 220 filling stations, predominantly in Europe and the USA, with a growing number in Asia where a production run of 1,000 cars using hydrogen fuel cell technology is expected from Hyundai by 2015. 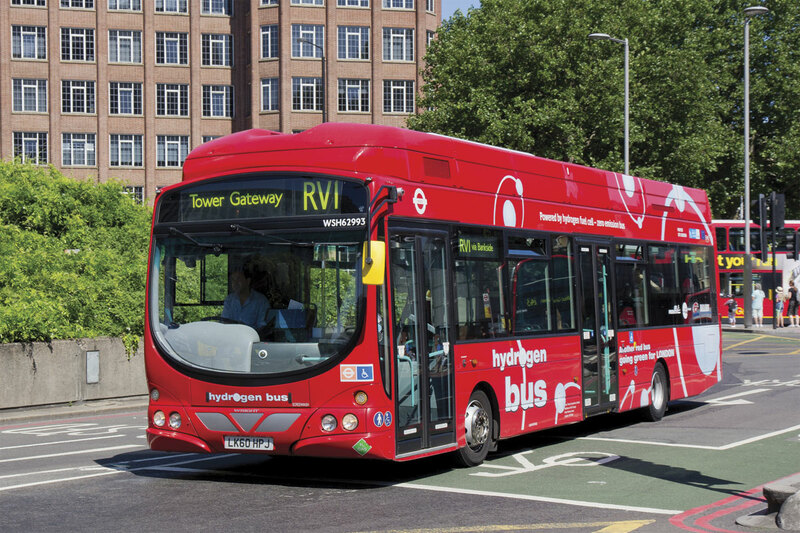 Most trials in the bus industry have been small scale with individual vehicles although the recent introductions in London, Hamburg and Aberdeen have significantly increased hydrogen’s presence. The IEA considers hydrogen to be a versatile fuel with no technical barriers that cannot be solved, market development being the key bottleneck. Combined with clean production technology, hydrogen is a sustainable zero emission transport fuel. It appears to have a particular benefit in support of renewable energy projects where excess electricity produced from wind and solar sites at times of low demand can be used to produce hydrogen by electrolysis, giving a fuel that is relatively easily storable and transportable. The trade support stands, spread over two floors of the conference centre, focussed strongly this year on rail, air, maritime and road freight activities. 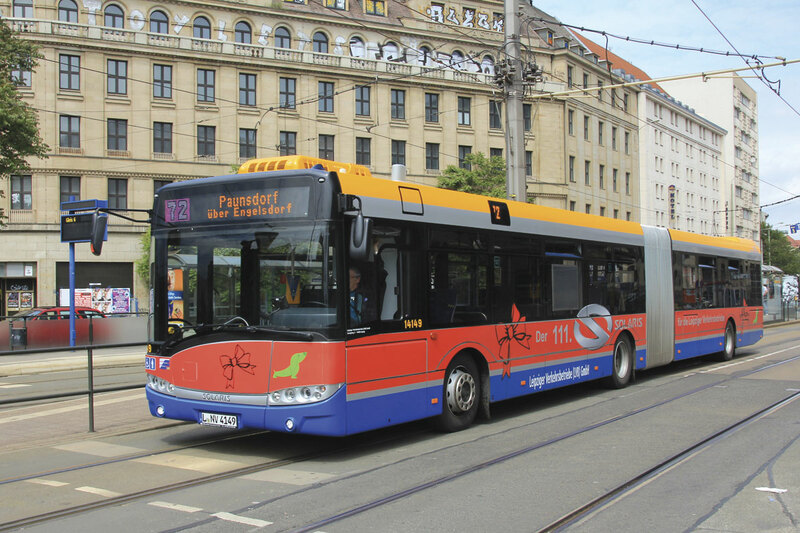 In previous years hybrid and electric buses have featured. Electric vehicles were there but in the form of BMW’s i3 and i8 cars. Toll collection systems and their data handling processes proved to be an area of interest with Toll Collect and AGES, both involved in the current German system, having large displays with proposals for handling the extension across all vehicle types and to more countries. Visits to the local BMW and Porsche plants and to the operations of Toll Connect and DHL were available to participants. There was plenty of high level food for thought from ITF 2014 and positive evidence of developments from the industry. For the road transport sector, ICT and the data it generates has the potential to impact positively on many areas including congestion and safety whilst providing a common platform for currently separate activities such as road tolls, public transport ticketing and driver licensing. Couple this with the prospect of driverless vehicles and there will also be the potential challenge of significant lower employment levels in the sector. The pace of development will prove a challenge to policymakers who will need to be flexible within an international framework to obtain the benefits likely to be on offer.